Pinkaew plays with the idea of martial arts osmosis in the fights. When she takes on the crew of an ice-house, she (quite appropriately) does Bruce Lee, complete with whoops. (Which makes the absence of Bruce Lee film clips rather glaring â€“ was there a rights problem?) In a later sequence she turns to Tony Jaa’s trademark Thai boxing moves, notably leaping into the air and bringing her elbow or knee down on miscreant heads like a piledriver. Okay, this wisp of a girl doesn’t make it look quite as skull-crushing as beefy Tony Jaa did, but it’s still an impressive move and a clever twist of choreography. 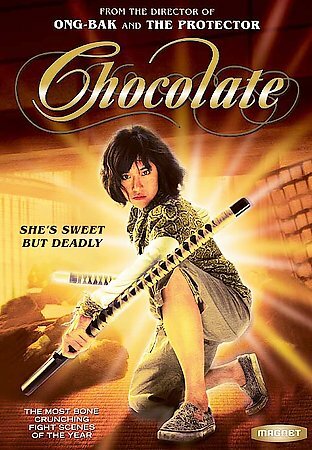 She just channels the fighter of choice (you’ll also spot bits of Jackie Chan in various scuffles) and lets loose. So does Pinkaew, who is more choreographer than director and not above second generation quoting – his final act opens on a fight that recalls Quentin Tarantino’s Kill Bill, itself a series of homages warped through Tarantino’s imagination. Pinkaew lacks Tarantino’s imagination. His filmmaking is often sloppy and his film is filled with awkward performances and contrived mugging for the camera (that’s what passes as comic relief). The offbeat details – Number 8’sÂ “Lady Boys Gang” (honestly, that’s how they are identified in the credits), who are either butch women or tranvestites, and Zen’s inexplicable aversion to house-flies (the result of eating one, snatched out of the air like a frog, as a small child?) – are simply gimmicks that are tossed off and quickly forgotten. But the fights are terrific, tightly choreographed with a good sense of ensemble movement and shot in long takes that preserve the fluidity of the action, like eighties-style Hong Kong action movies. For the finale, which spills out into the alley, up onto a commuter train bridge and all over the warren-like ledges and balconies and hallways of a slum apartment complex, he delivers the “Oooh, that’s gotta hurt” brand of Hong Kong stunts that can still make you wince (watch our bad guy hit every railing – plus a handy neon sign attached to the side of the building – on the fall from the fourth floor). And Pinkaew takes another cue from Jackie Chan movies and runs his closing credits over outtakes and injuries. The Exterminating Angel (two-disc edition) and Simon of the Desert from Criterion – read Dave Kehr in The New York Times and Dennis Lim in the LA Times.